Anastasia came to plant trees at an orphanage. Little by little, she fell in love with the orphans. I met Sergey (Seryozha) for the first time a year ago during a cleaning day in Kalinovka. While almost all the orphans there were going around helping us, making friends with us, and grabbing us by the hand, Sergey sat smiling, near the house porch. Sergey was one of very few orphans in the Happy Home who could speak and always asked me how I was and what was new since my last visit. He remembered what I wore, what I said or promised. Sometimes, he even noticed subtle things in my words, so it made me realize that Sergey could see much more beyond what we notice every day. This boy with a big heart, who shared it with everyone around him, was looking forward to his big dream of living in a real loving family. Sergey believed with all his heart and soul that there was his mama somewhere in the world. He honestly hoped to see his mom in every woman who visited Kalinovka. In March 2014 while Russian troops began occupying southern Ukraine (Crimea), Sergey’s mama found him. Sergey was nervous and feared that something could go wrong and that his future parents wouldn’t like him. One of the reasons of his deep concerns was the complicated situation in Ukraine. He genuinely wished peace and it really upset him to see on TV how cruel and stupid people could be. One of the biggest obstacles was to bring his birth certificate from Crimea, which was recently annexed by Russia. Sergey was willing to wait but he couldn’t help but feeling worried and burst into tears imagining that he would have to stay longer in the orphanage. This young man prayed and hoped for the best. Finally, the time came when Sergey’s future parents were able to officially call him their son. There are few people ready to choose this winding road and bravely walk along it. And while he is not their biological child, Sergey is their chosen son. They made enormous efforts to make Sergey part of their family and are committed to pouring their heart and soul into raising him. After 16 years of patience, Sergey is gracefully rewarded the love of a momma and papa. Sergey’s Shirt reads: Superman Was Adopted. The next time we saw Sergey, he met us with a spirit of confidence and happiness. 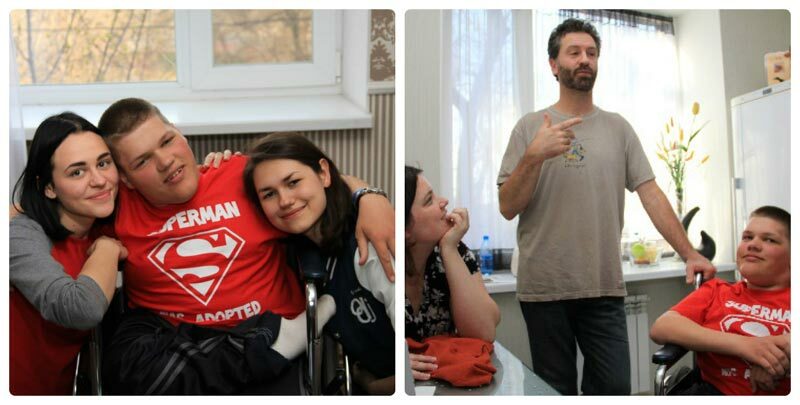 Now Sergey has people who will take care of him, which is in itself, an art of love. Sergey’s love is felt by everyone. The gracious Sergey was the first to make and offer tea or do the dishes by himself. Instantly, Sergey and his papa became best buddies. They made silly faces and laughed for hours. Language was never a barrier. Sergey also managed to use his wheelchair by himself. Before, he used to ask for help and all of a sudden, he climbed on bars asking to be taught how he could stand on his feet. He was filled with a burning desire to move and live. There is certainly a very special kind of happiness – to be happy for someone else. I was overwhelmed with such a feeling when Sergey left for America. He was blooming and becoming stronger. He now possessed more strength and enthusiasm to go on fighting for his happiness. He finally knew the goal and value of his destination. Wesley and Karen, his parents, gave him the most wonderful feeling of a solid foundation. When someone believes in you – you gain the courage to reach your goal. I tried to explain to him that it did not matter whether or not I was disabled. I told him that we were friends regardless, but he did not believe my words. Before his train departed to Kyiv, Sergey hugged us tightly, and confidently called us his friends. Sergey’s change of attitude and outlook now allowed him to be himself, and to live his life to the fullest without being dependent on anyone else. We agreed to meet in a couple of years and visit his old “Happy Home” at Kalinovka together. I hope that one day he will come back an entirely independent, strong and happy person. The Blake Family is now joyfully settling down in North Carolina while getting used to their new life together. Sergey is learning English, and taking pleasure in teaching his parents some Russian (which is at times a hilarious scene due to some interesting Russian pronunciation by Sergey.) The whole family is feeling blessed to be together. Sergey never gave up on his dream! 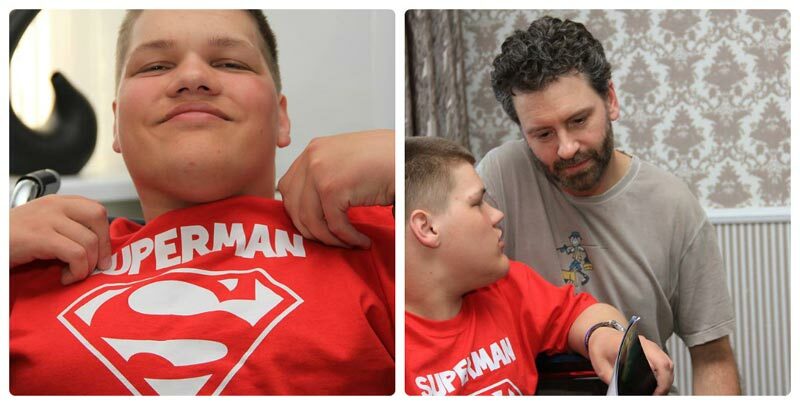 His story highlights the true compassion and generosity of people who want to provide a loving home to special children. It is my hope that the other little orphans with special needs in Kalinovka will one day be as fortunate as Sergey to have a mama and papa too! Sergey gave this drawing to his mom on April 5th, 2014. It says, Mama, Papa, Sergey. Sergey now has a loving home, BUT there are still other cutie pies at Kalinovka who still need our help. Click HERE to make a difference.